In 1952 five children were playing football in a small town called Flatwoods, WV when a strange object appeared above them. Streaking across the sky, they watched it crest a nearby hill, slow and then descend just over the top of the ridge. What followed after their sighting has become one of the most infamous local legends ever recorded. That night, seven area residents encountered a hovering, mechanical monstrosity that was described by area newspapers as “glowing” “Frankenstein-like” and breathing fire. The event helped shepherd in the 50s obsession with flying saucers and alien lifeforms and the “Green Monster” (one of three named given to the creature) has become a pop-culture figure in the decades to follow. In the years since their brush with the “Flatwoods Monster”, witnesses have seen their story evolve from a terrifying, true-life event to little more than a fable. Now, two of the original witnesses will set the record straight on just what it was they saw that warm, September evening when a new documentary titled The Flatwoods Monster: A Legacy of Fear, is unveiled next April. Ahead of the film’s release, the first teaser has arrived featuring clips of interviews with witnesses, and Flatwoods residents. Included alongside the trailer are the official poster by acclaimed horror artist, Sam Shearon, as well as two alternate takes on the monster itself by Mark Randall and Brandon Scalf. Each poster gives a unique, alternative view of the creature; indicative of the direction the movie itself will take in examining the constantly-changing portrayal of what was seen. The film is being released by the award-winning, Small Town Monsters production company, who are responsible for last Spring’s, “The Mothman of Point Pleasant”; another documentary centered around a well-known West Virginia legend. “Flatwoods” is directed and written by Seth Breedlove, director of the award-winning Boggy Creek Monster. The film features an original score composed by Brandon Dalo and cinematography by Zachary Palmisano with special FX by Santino Vitale and fully animated sequences by Chris Scalf. 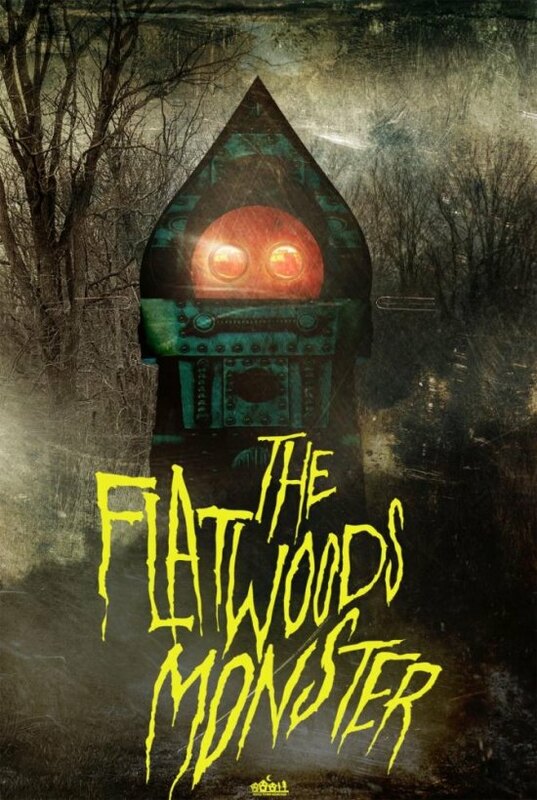 The Flatwoods Monster will be released on DVD and Amazon next April with a wider digital release planned thereafter. The film will be part of Small Town Monsters’ annual Kickstarter campaign which will be used to fund post-production on “Flatwoods”, as well as two additional films (all to be released in 2018) when it launches on January 25th. The official premiere will be held at the Elk Theater in Sutton, WV on April 7th with members of the Small Town Monsters crew taking part in a Q&A following the showing.